Dr. Abbey Kruper joined the Medical College of Wisconsin in 2013. She completed her undergraduate degree at Marquette University and received her Doctorate of Psychology with a specialization in Health Psychology from the Illinois School of Professional Psychology. Dr. Kruper went on to complete her Internship at the Carl T. Hayden VA Medical Center and her Post-Doctoral Fellowship in Behavioral Medicine at Loyola University Medical Center where she remained on faculty prior to joining MCW as Director of Transplant Mental Health Services. Dr. Kruper joined the Department of Obstetrics & Gynecology in 2016. Dr. Kruper’s clinical interests include assessment and psychotherapy with specialization in adjustment to health status and treating co-existing psychological disorders. She works with patients to promote well-being through health behavior change and more adaptive coping. In the department of OB/GYN, Dr. Kruper focuses specifically on perinatal mental health as well as psychological aspects of infertility and cancer. Dr. Kruper is an active member of the Society of Behavioral Medicine as well as adjunct instructor at Marquette University. She sees patients in the Department of Obstetrics and Gynecology clinic at Froedtert Hospital, located in the Specialty Clinics Building, in addition to the Reproductive Endocrinology & Infertility Clinic at North Hills, and the Gynecologic Oncology clinic located in the Cancer Center’s Courage Clinic. 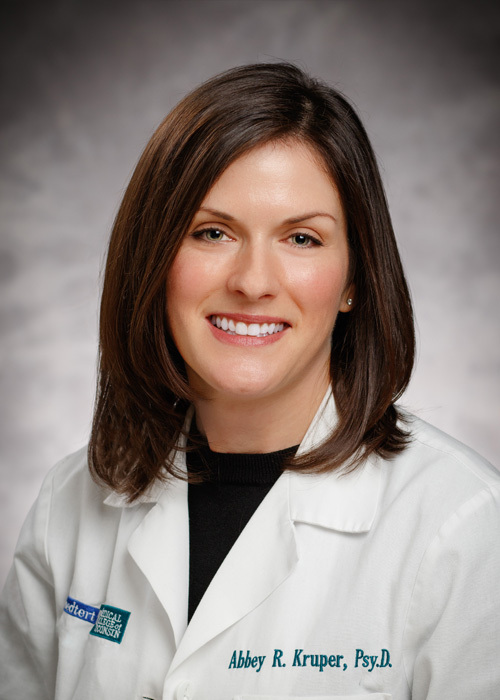 Abbey R. Kruper, PsyD, has been appointed Assistant Professor of Obstetrics and Gynecology in the divisions of Obstetrics & Gynecology, Maternal-Fetal Medicine and Reproductive Endocrinology & Infertility, at the Medical College of Wisconsin.